Two -pip Policeman. 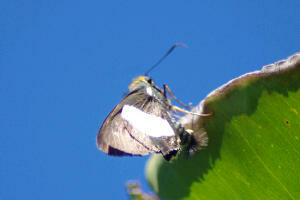 I took this photo in Nelspruit in my garden on a leaf of an banana tree. Fast power flier and stays long on same spot so easy to take a photo off and study. Best time to go explore in your garden and find this Two-pip Policeman is early in the morning and late afternoon. Larvae feed on variety of plants and leaves. Medium-sized wingspan between 45 mm.Will also be found in edges of the rain forest and coastal bushveld.